Posted on November 21, 2013 at 8:21 am. Young love. An instant connection made across a crowded kitchen counter top. They knew this time around, it was for real. Real yummy that is. 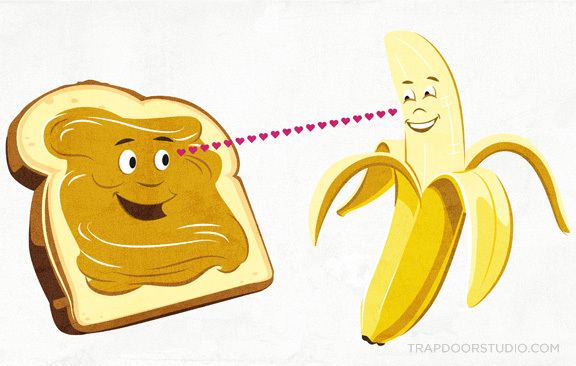 Warm, toasty toast with peanut butter and sliced bananas, if you haven’t tried it, you’re missing out. 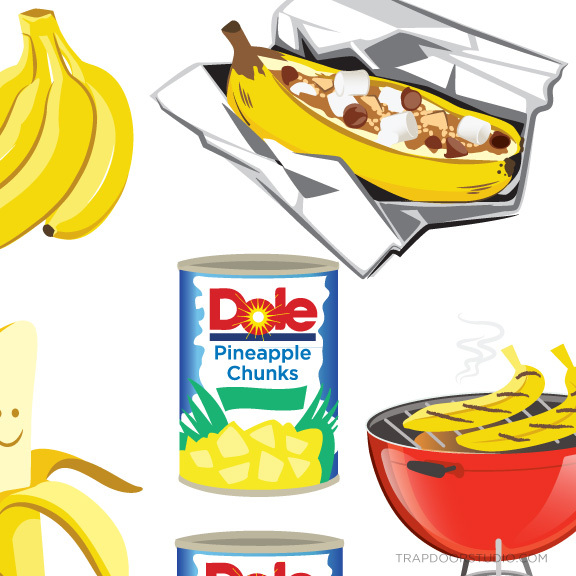 My own hunger pangs aside, I give you retro food characters for Dole! 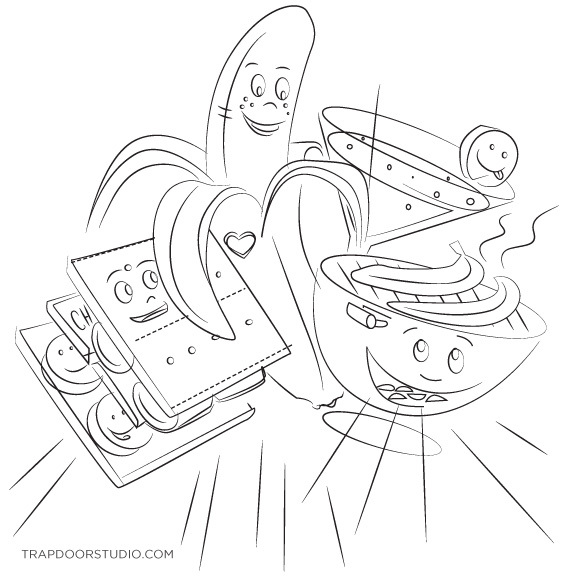 I got the call about this banana-centric project from the Tallyman…er… I mean “talented” crew at the Lavidge Company. 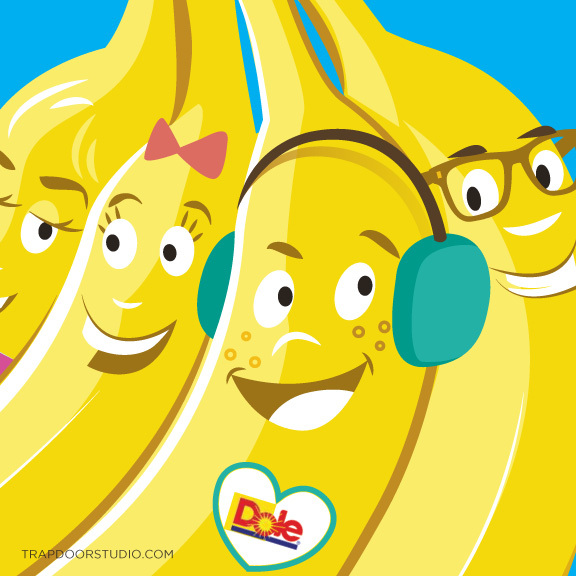 It was a fun summer concept they had going for Dole bananas called “Peel the Love”. This is another example of a fast and furious turnaround project that I still managed to have fun with. 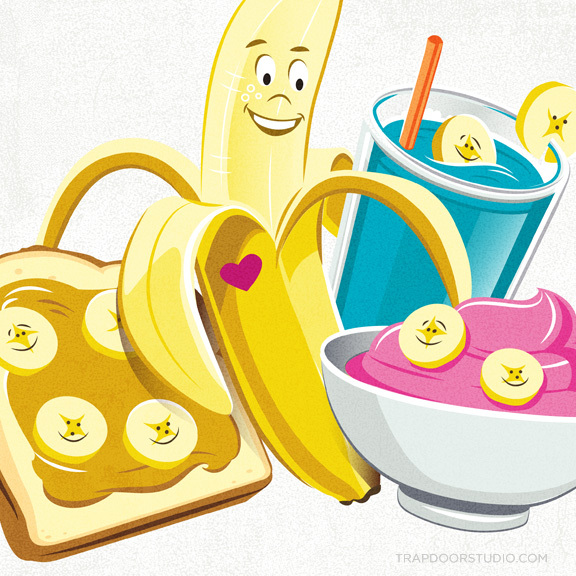 The project broke down into 2 parts featuring illustrations of the bananas as playful characters, and recipe ingredient illustrations used as infographics. This is the Initial “approved” family illustration where we worked out character styling. Winter timing on this piece, hence the earmuffs and scarf. 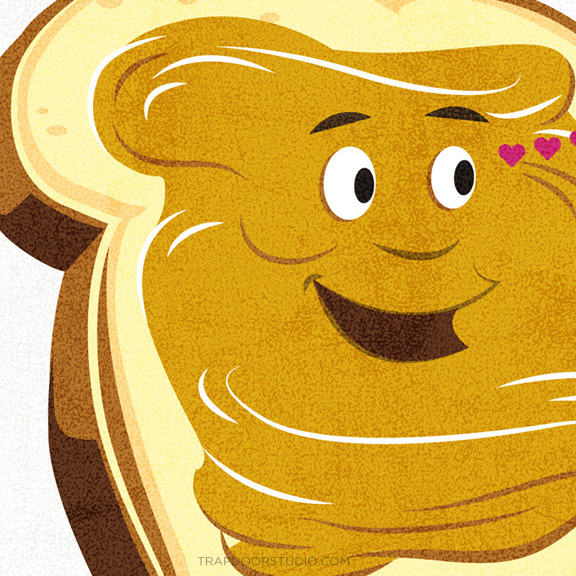 Banana and PB toast (detail). Composition sketch. I like the exuberant grill here with coals in his mouth. 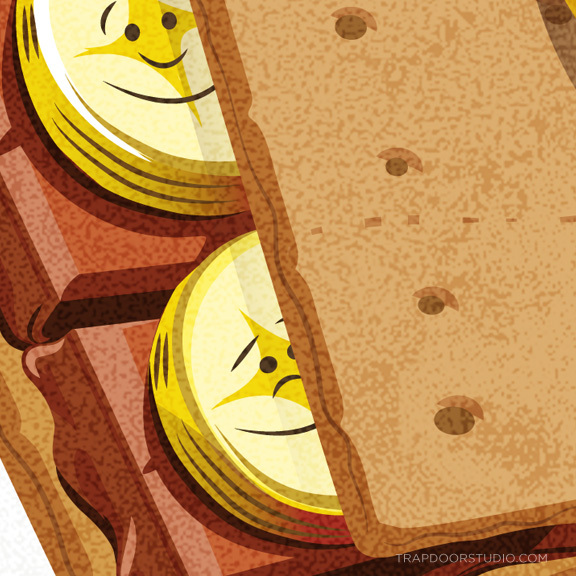 MMMMM, Melty Chocolate and toasty banana slice topped with graham cracker. 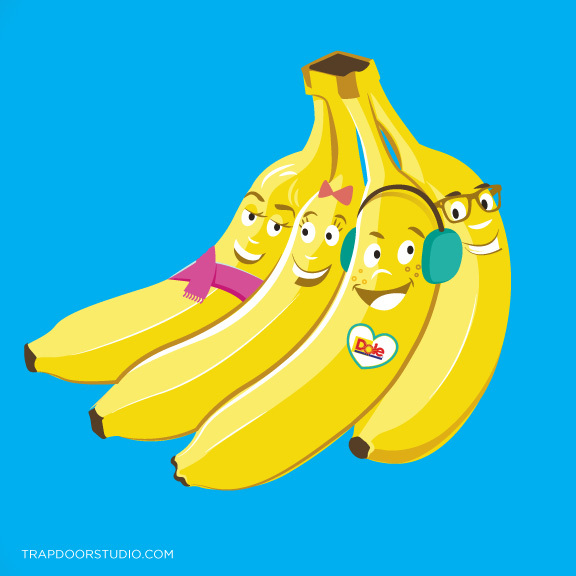 BANANA DAYS – healthful livin’ of course. 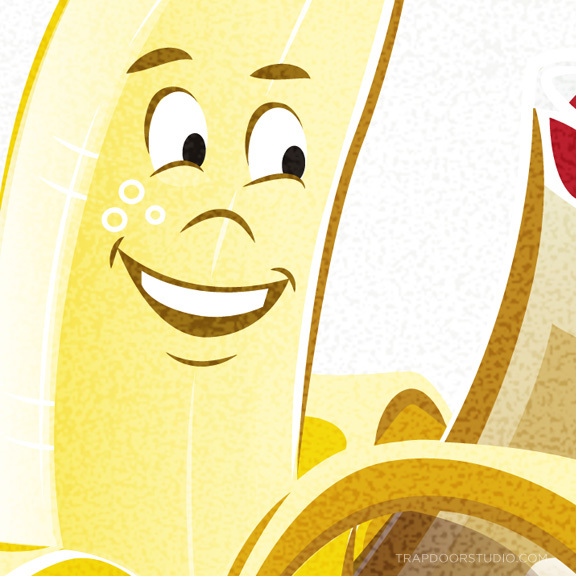 Bananas Make everything alright, OUTTA SIGHT! I started out with a list of all the ingredients you’d need for the recipes included in the promo. From rum and fresh fruits to graham crackers, crushed and whole. 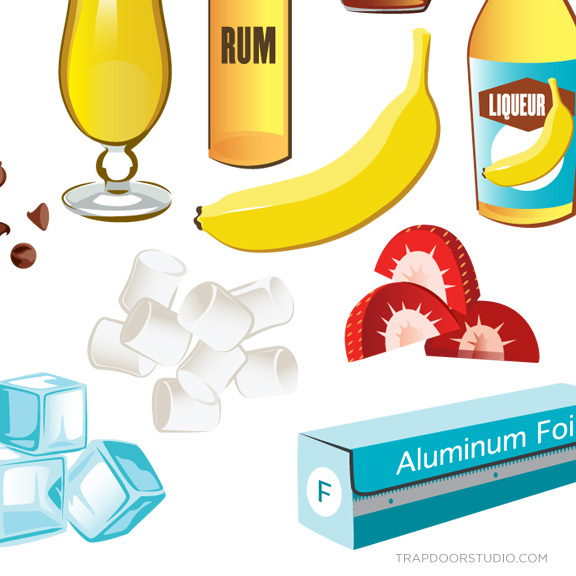 Right down to boxes of aluminum foil I covered all the bases. Spot colors and “simple” shading effects were employed. Smores inside of a banana peel? of course! Check out that wrinkled foil, a complicated item that reads in a simple way. Took me a few tries to get it right. 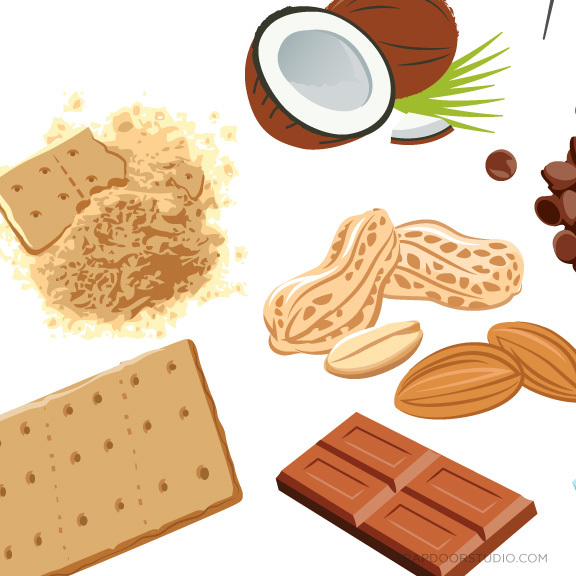 A variety of nuts and brownish things. Even da co-co-nut. 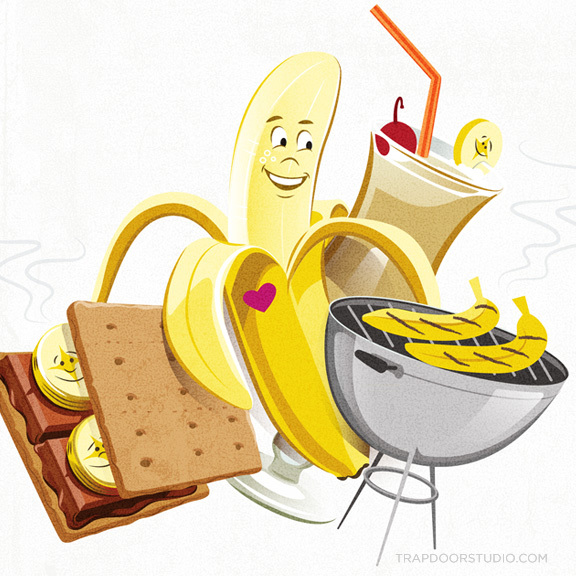 Melty smores and grilled bananas, tropical drinks and maple syrups. Here’s a photo of the promotional kit Lavidge created. Melissa McFarlin and Daniel Goldberg from the Lavidge Co. did an amazing job concepting and designing the project, Special thanks to Debi Mees for helping make it all happen. It was a treat being along for the ride. All tallied I made 30 illustrations, it was quite a haul. Now tally me banana, maybe in a blender with some rum, it’s time to celebrate! If you like this article, here’s a few more you might enjoy. 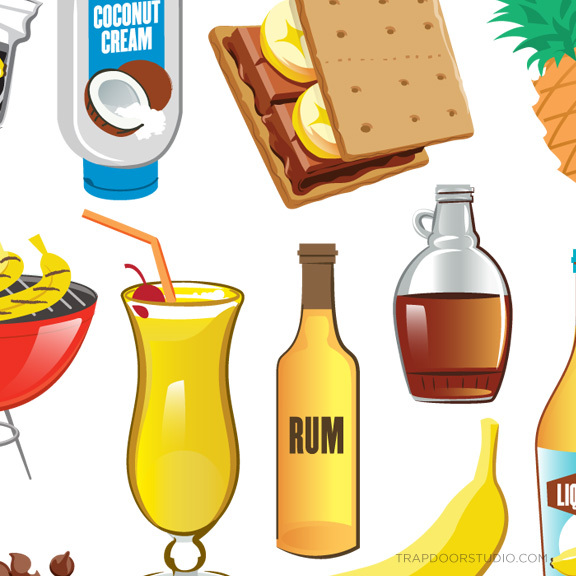 Netflix Infographics, Sweetish Finn Poster, The Getaway Poster, Goin’ Apey.